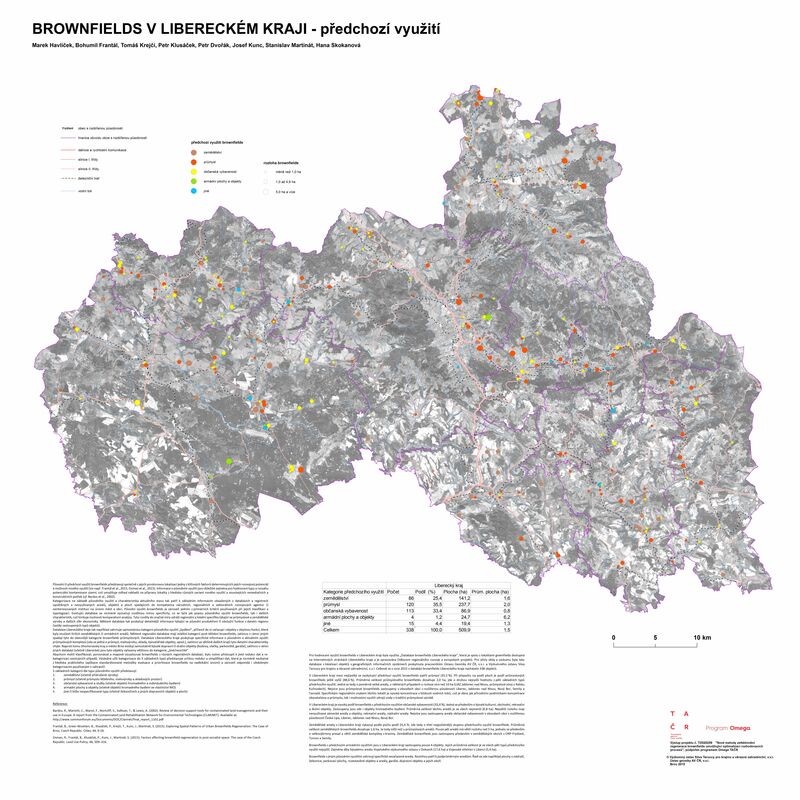 Academic paper in Land use Policy was published - Osman, R., Frantal, B., Klusacek, P., Kunc, J., Martinat, S. (2015): Factors affecting brownfield regeneration in post-socialist space: The case of the Czech Republic. Land Use Policy, vol. 48, November 2015, 309-316. DOI: 10.1016/j.landusepol.2015.06.003. IF: 2,631. Academic paper in Cities journal was published - Frantal, B., Greer-Wootten, B., Klusacek, P., Krejci, T., Kunc, J., Martinat, S. (2015). 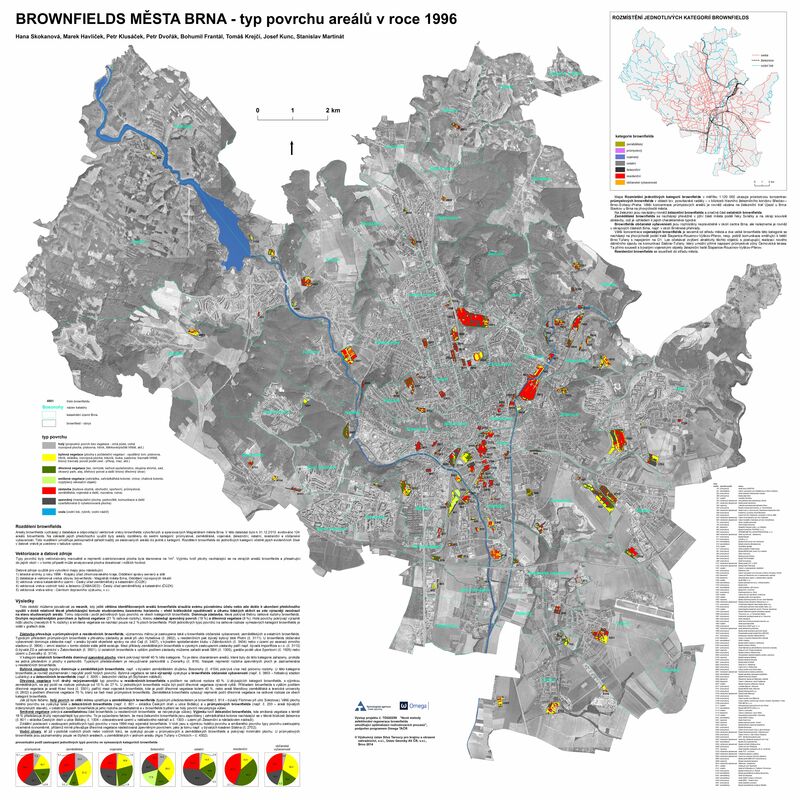 Exploring Spatial Patterns of Urban Brownfields Regeneration: The Case of Brno, Czech Republic. Cities, 44, 9-18..
Hlavní řešitelé / Responsible researchers: Petr Klusáček, PhD. ; Marek Havliček, PhD. Členové řešitelského týmu / Members of research team: Bohumil Frantál, PhD. ; Hana Skokanová, PhD. ; Assoc. Prof. Josef Kunc, PhD. ; Mgr. Tomáš Krejčí; Petr Dvořák, PhD. ; Stanislav Martinát, PhD. 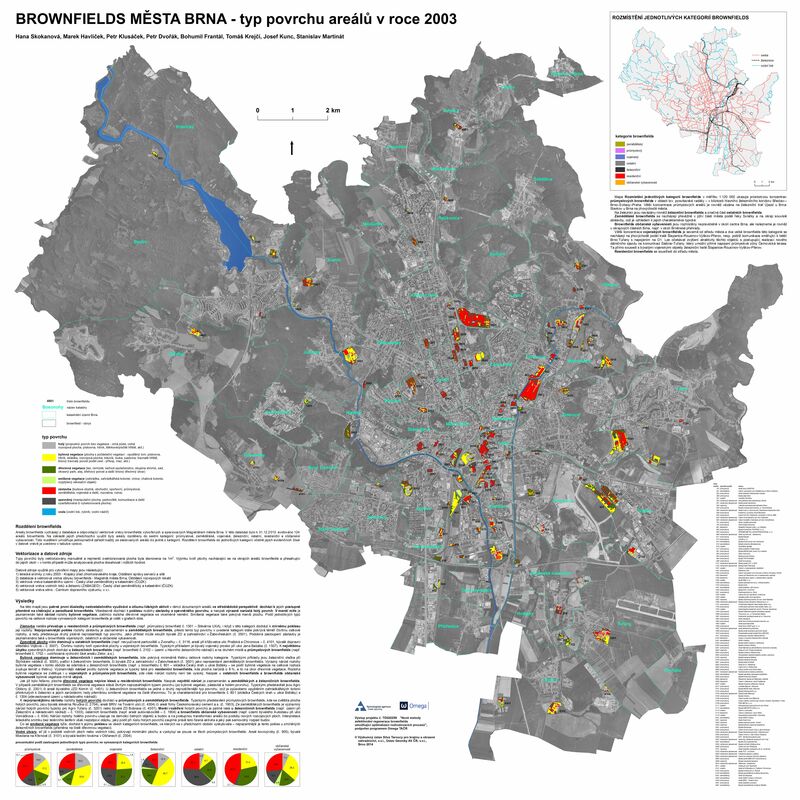 Cíl projektu: Základním cílem projektu je vytvořit metodiku optimalizace rozhodovacích procesů pro regeneraci brownfields jako všestranného nástroje pro orgány státní správy a místní samosprávy, organizace zabývající se regionálním rozvojem a územním plánováním, majitele areálů brownfields, developery a potenciální nájemce či uživatele objektů a areálů. 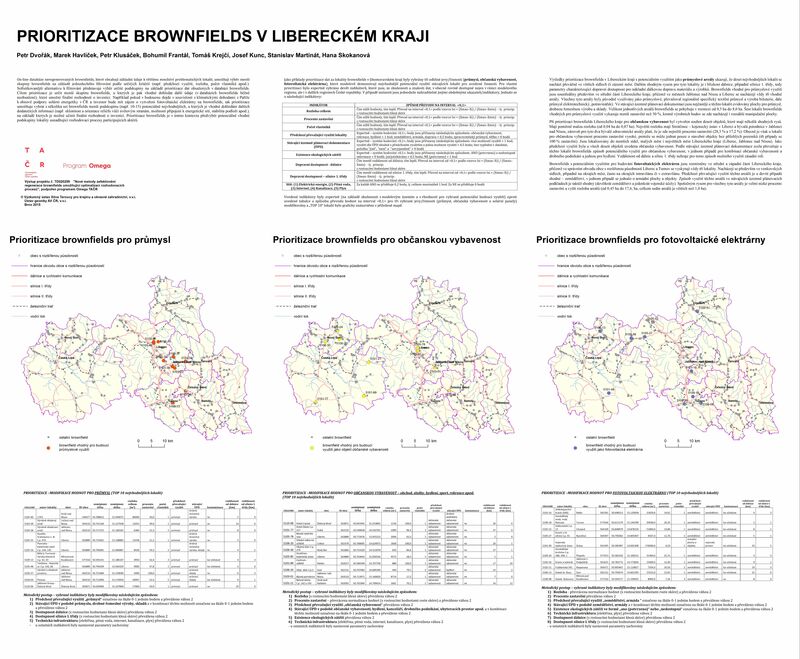 Dílčím cílem projektu bude vytvoření nových metod pro verifikaci, objektivizaci a aktualizaci údajů v existujících databázích brownfields za pomoci využití geoinformačních technologií a moderních zdrojů (např. leteckých snímků). Aim of the project: The main objective of the project is to develop a methodology for optimizing decission-making processes used in brownfield regeneration. This versatile tool can be used by state and local governement, organizations involved in regional development and spatial planning, brownfield sites owners, developers and potential tenants or user of the buildings and premises. The partial objective of the project will be to develop new methods for verification, objectification and updating existing databases of brownfields through the use of geospatial technologies and modern sources (e.g. aerial photographs). 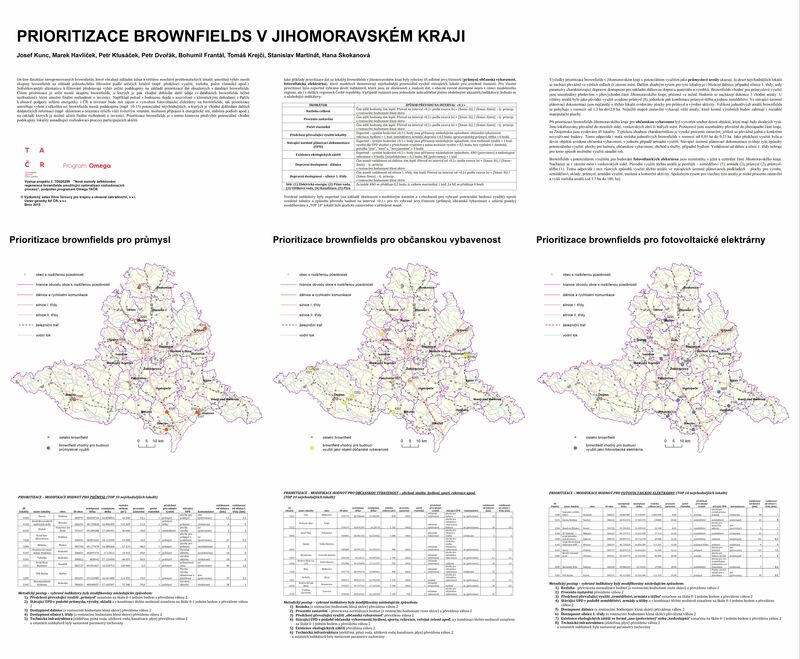 Osman, R., Frantal, B., Klusacek, P., Kunc, J., Martinat, S. (2015): Factors affecting brownfield regeneration in post-socialist space: The case of the Czech Republic. Land Use Policy, vol. 48, November 2015, 309-316. doi: 10.1016/j.landusepol.2015.06.003. IF: 2,631. Frantal, B., Greer-Wootten, B., Klusacek, P., Krejci, T., Kunc, J., Martinat, S. (2015). 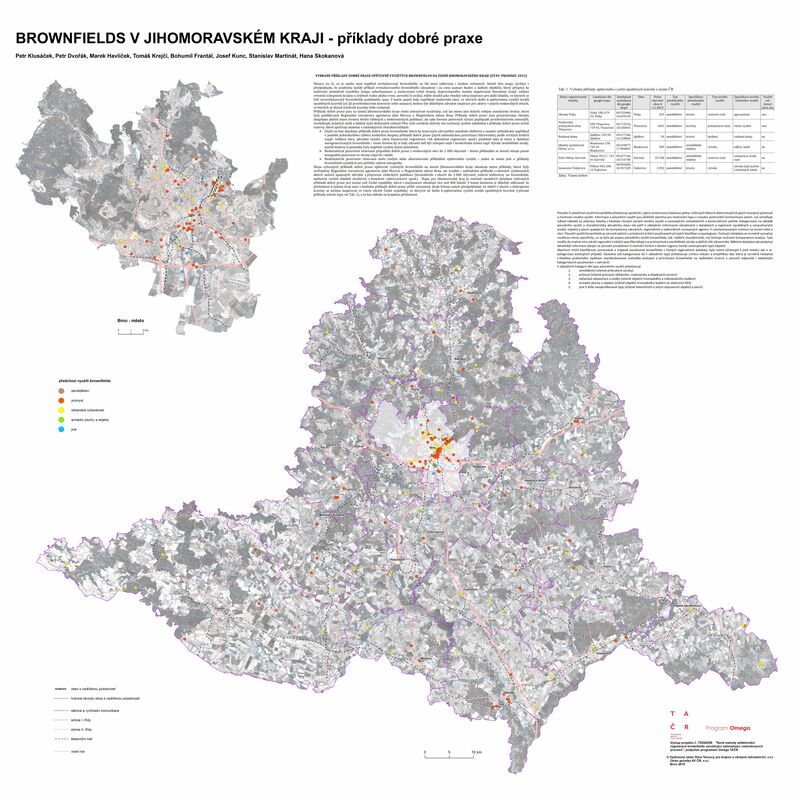 Exploring Spatial Patterns of Urban Brownfields Regeneration: The Case of Brno, Czech Republic. Cities, 44, 9-18. doi:10.1016/j.cities.2014.12.007. IF: 1,836. Klusáček, P., Havlíček, M., Dvořák, P., Kunc, J., Martinát, S., & Tonev, P. (2014). From Wasted Land to Megawatts: How to Convert Brownfields Into Solar Power Plants (the Case of the Czech Republic). Acta Universitatis Agriculturae et Silviculturae Mendelianae Brunensis, 62(3), 517-528. Martinát, S., Navrátil, J., Dvořák, P., Klusáček, P., Kulla, M., Kunc, J., & Havlíček, M. (2014). The Expansion of coal mining in the depression areas - a way to development?. Human Geographies, 8(1), 5-15.